Over 400 games to play. 24/7 support, including live chat. Great range of payment methods and currencies. Titan Casino was founded in 2008 and has quickly gathered market share as it developed its platform to give players what they really wanted. The casino promises to treat every customer with care and attention, whilst offering an unparalleled gaming experience. Their goal is to push online casinos to the next level. In this Titan Casino review, we will be exploring whether the operator succeeds in this mission. 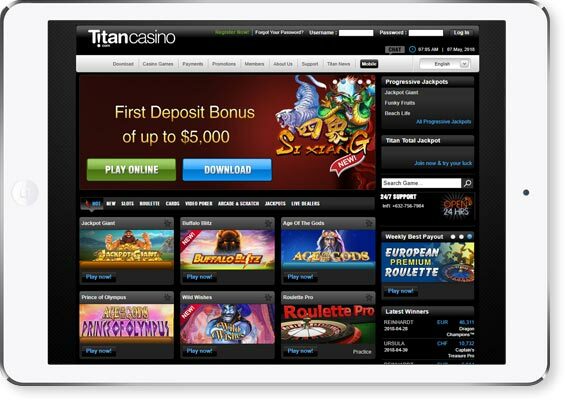 We also include a Titan Casino mobile review, for fans to who enjoy playing at casinos whilst on the go. First impressions count, so this casino has developed a clean and simple website that helps you find what you want quickly. There aren’t overly flashy graphics distracting you from logging in or starting a game. Instead, there is a clear navigation bar right at the top of the page and other useful links strategically placed across the page. One aspect of this casino which sets it apart from most modern casinos is that it requires a download to enjoy the entire list of games and a number of gameplay features. Fortunately, the developers have made this step as straightforward as possible, so as not to discourage players. The 3-step process consists of downloading and installing the casino’s executable file, creating an account and starting a gaming session. More about the final two steps will be covered in the next section of this review. The main gaming provider of the casino is Playtech. The company has almost 20 years of experience in providing fun and engaging games in a variety of genres. This solid partnership ensures that players can choose from any of their 400+ slots, card games, live dealer games and much more. All these games are continually tested by Gaming Laboratories International, one of the leading fairness labs in the world. This casino’s responsible gaming efforts also include checks to ensure no under-age players. Once you’re In the casino’s homepage, you need only click on ‘Download’ button in the navigation bar and the executable file instantly starts downloading. Next, you need to install the file, and the casino perfectly explains how to do this if you need assistance. Once the file has been installed you will see the Titan Casino icon on your desktop. Open it and click on ‘Play For Real Money’. An account opening form will appear next. Fill in your personal details and all the other information and you’re done. You’ll get a unique username, and you’re off! The casino’s games together with many other features are now at your disposal. You can choose to play at the casino via the desktop icon or online, although with some limitations. To login using the desktop icon, you need simply open it and enter your username and password. If you decide to play online you can find the login fields at the top of the homepage. You can choose to have your details saved for even faster access. When entering the casino’s lobby through the desktop icon you will have access to a number of important options. For starters, you can change the games’ speed, size, and sound. You can also see your current balance and set your own limits. Finally, and probably most importantly, you can search through and launch all of the casino’s games. No review can be complete without mentioning the casino’s bonuses. This operator offers new and existing players a number of what they themselves describe as dazzling promotions. It begins with the all-important welcome bonus. This is the bonus which casinos compete for the most on, as it is the one which has the biggest impact on the casino’s revenue. This casino is known for offering massive match bonuses on first deposits. You can always find the latest offers running on Titan Casino in the bonuses widget on this page. To keep existing players coming back, the casino offers numerous tournaments as well as slots with impressive jackpots. In order to keep things interesting, the casino has both ongoing offers as well as limited time events. There are so many ways that players can boost their funds that the casino dedicates an entire section on its promotions. This topic will also be covered in the Titan Casino mobile review further on. The casino makes it a point to reward loyal players through its VIP Club. The club is made up of five tiers and players need only play with real money at the casino to form part of the club. Whilst all members of the club receive gifts, bonuses, and other opportunities, it is the higher tier members that are truly pampered. They get faster withdrawals, a dedicated account manager, and fantastic bonuses. This casino also operates a loyalty programme which you can benefit from whenever you place a wager in any of their games. In exchange for the amount you wager you receive comp points, which can be exchanged for a number of great gifts. You can find detailed information about this programme on the casino’s homepage. As we mentioned earlier in this review, all the games available are powered by Playtech. This game developer is known for masterfully designing an impressive list of popular games. If you are looking for some adventure, you could try slots such as Top Gun or Gladiator Jackpot. For a more skill-based game, perhaps you’d like to try your hand at Blackjack Surrender. The best part of writing this review involves playing the games offered by the casino. What caught our eyes was the range of special games, such as 3 Clowns and Mega Balls, which are both listed as arcade games. There is also a choice of video poker games and scratch cards to keep you entertained each time you log in to the casino. As we were researching this Titan Casino review and the Titan Casino mobile review we were impressed by the selection of payment options available to players. The casino has ensured that cards, e-wallets and wire transfers are available for both deposits and withdrawals. Options vary by country so it is always best to check what methods and currencies are available in your country first. Check out the banking widget on this page for the most up-to-date information about the deposit methods and withdrawal time frames you can expect on Titan Casino. Earlier in this review, we mentioned GLI which ensure a safe playing experience. The casino also makes use of the latest technology to ensure confidential information and payments are kept safe and secure. Titan Casino is licensed in Malta by the Malta Gaming Authority, which requires operators to offer a highly secure environment for players and partners. When writing this Titan Casino review we were very impressed by the options available to get in touch with the customer care team. The best way is certainly the live chat option, which is available 24 hours a day, 7 days a week. Other options include an international telephone number as well as a range of contact emails to get in direct contact with the department you are looking for. The casino offers players that enjoy playing on handheld devices a selection of exciting games. The good news is that there is an app to download, so the mobile-friendly casino can be accessed on any device, including Windows and Blackberry. As we discovered while writing this Titan Casino mobile review, the mobile version of the casino even allows you to place safe deposits. Logging in to the Titan Casino via your mobile could not be simpler. If you are already registered, simply enter your username and password to access the casino’s lobby. New players need to register first, but this process is very easy and involves filling in a registration form. As you are checking out this Titan Casino mobile review, then you might be wondering how to access the mobile casino lobby. By visiting the casino on a desktop you can have the correct link sent directly to your phone by email or SMS. Alternatively, you can use a QR code reader on your phone and match it to the code on the casino’s homepage. However, more often than not, you need to simply enter the casino’s main homepage on your mobile and you will be instantly re-directed to the mobile-friendly page. In the process of writing our Titan Casino mobile review we tested several of the games on a variety of mobile phones. The responsive design of the games became instantly apparent. No matter the screen size, the processor or the brand of the phone, the games run smoothly and offer an exciting experience every time. At this point in the Titan Casino mobile review, we might as well mention how Playtech manages to create games that are fun to play on desktop and mobile devices alike. The intense Rocky slot game or the cute Love Match scratch cards are a great example of the variety available in the palm of your hands. When your mobile game is interrupted, due to a call or a loss of connection, you can simply resume gameplay when you reconnect. Just like when playing at Titan Casino from a desktop computer, playing on your mobile allows you to play games in practice mode. Simply swipe upwards to start a game in practice mode and make sure your device is horizontal. This casino truly delivers when it comes to using your mobile phone for more than just playing. In fact, you can make both deposits and withdrawals directly from your mobile phone. The casino has invested in the technology that allows swift payments in a secure environment. Just like when using a desktop computer for payments, mobile payments can be done via cards, e-wallets and bank wire transfers. Certain restrictions apply depending on country of residence, but the options available and very satisfying. When compiling our review we explored every aspect of the casino and one thing was apparent; the casino always puts the customer first in its decisions. In the design of their online casino, their payment options and everything else, the customer experience is always given top priority. The casino has been able to build on its own experience, which spans over a decade, to continually develop and offer new services. If our Titan Casino mobile review proved just one fact, it is that playing on the go is now a possible reality, with practically all the options available to desktop players. No matter what your favourite type of online casino game is, chances are you will find it at this casino. What’s more, thanks to Playtech’s experience in designing games, you will find a number of different variants to try out. In order to enjoy the full casino package, we recommend downloading the casino app.